I am proud to announce April's competition winner, Sharon, who won a Canon CISS printer bundle! Thank you to everyone who took part in April's competition. Today we have a fantastic review from Sandor that has one of our CISS systems. 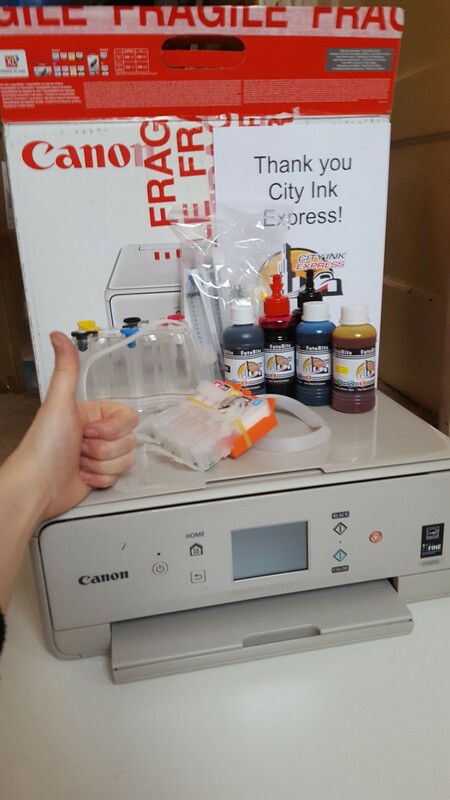 If you'd like to be entered in our monthly prize draw, and receive a discount on all dye and pigment ink purchases, send your review to reviews@cityinkexpress.co.uk. Since receiving this product it works perfectly, the colours are beautiful in the pictures. Since I’m really satisfied with it, I will order the ink from the City inkpress in the future, too, and also recommend it to everyone. Today we have a fantastic review from Robert that has one of our CISS systems. If you'd like to be entered in our monthly prize draw, and receive a discount on all dye and pigment ink purchases, send your review to reviews@cityinkexpress.co.uk. I highly recommend the CISS for the Epson BX300f. I have previously used the official Epson ink cartridges, though these were not always available, and were very expensive. I have also tried the unbranded ones from supermarkets etc, but frustratingly hard to get them recognized. So when I heard about the continuous ink system, I thought to give it a try, especially as it offered a lot more ink at the same price as a set of official ink cartridges. The extremely helpful YouTube videos, on priming the cartridges and installation, make installing the ciss fairly easy. Though I would recommend some gloves and kitchen roll on your work surface.